Home Uncategorized How is Cutlery made? Eating or serving with utensils made of silver, silver-plated metals or stainless steel is relatively recent. Silver needed to be discovered in sufficient quantities, the smelting processes necessary to hand-craft silver needed to be refined, and in Northern Europe it took several centuries before the more civilized Latin table manners replaced the cruder Anglo-Saxon ones. Henry VIII, the most famous of England’s Tudors, used his hands to tear off large pieces of beef from an entire roast set before him, throw the meat on his trencher board, chop off smaller pieces and shovel them in his mouth. Such table manners were acceptable until the publication of books on manners by Castiglione (1478-1529) and Peacham (1576-1643). Around that time, fine silver table services and eating implements were introduced into English court life. Banquet halls started to use solid silver platters and plates, silver-mounted drinking vessels, silver-handled knives and a variety of spoons. Unassisted bare hands, however, remained the norm for the “lower orders” in England for another century or so. The spoon was one of man’s earliest inventions, possibly as old as the custom of drinking hot liquids. In Northern Europe, the first spoons were carved from wood. Later specimens were fashioned out of horns of cattle, ivory tusks, bronze, and eventually silver and gold. The earliest mention of spoons made from precious metals is found in the Book of Exodus, when Moses is commanded to make dishes and spoons of pure gold for the Tabernacle. Moses asked Bezalel (the first spoon-maker known to us by name in history) to work in gold, silver and brass. Since Bezalel had come with Moses out of Egypt, he must have learned his trade there. Many Egyptian spoons were cast in the form of handled dishes with a cover and a spout, an elaborate but not very practical design. Greek and Roman spoons, on the other hand, looked much more like the spoons we are used to seeing in modem times. Pan, the patron of shepherds and huntsmen, was honored with spoons in the shape of a goat’s foot. The Roman fiddle-pattemed spoon, originating in the first or second century A.D., resembles the modern type we know today, except for its squared off stem-head, rather than the arched appearance with which we are familiar. The first English spoons, made of horn or wood, were probably imitations of those brought in by Roman troops in Britain. The Angles and Saxons introduced a spoon with small, pear-shaped bowl. By the fourteenth century, castings of bronze, brass, pewter and sheet tin were fairly common. The knife, used by hunters and soldiers for cutting and spearing the meat, was first made of flint, then of metal. Its main characteristic was a sharp edge. Traces of the primitive knife, such as the incurved shape at the top, or the beveling of the metal to achieve an edge, are still present in some of our styles today. Handles at first were only long enough to allow a firm grip for carving. In the 1630s, the Duke de Richelieu, chief minister to France’s Louis XIII, ordered the kitchen staff to file off the sharp points of all house knives and bring them to the royal table, thereby introducing the knife as an every-day eating utensil for the aristocracy. Forks were introduced at the table around the time of the Crusades, at the beginning of the twelfth century, when Venice’s Doge Domenice Silvie and his Dogess placed a fork beside each plate at one of their banquets. The forks took about three centuries to gain acceptance, probably because the custom of placing food in one’s mouths with both hands, Five fingers, or—for the refined few— three fingers, was more expedient than using a new gadget. Most dinner guests first carried (heir own knives. After the introduction of forks, the custom of guests providing their own eating utensils continued, and attention was given to minimize the space occupied by the knife and fork when not in use, with the fork sometimes serving as a handle for the spoon. The production of tableware on a wide scale in England after 1650 played a large role in improving the dinner-table etiquette. In time, strict laws demanding high standards greatly enhanced the quality of silverware. Silversmiths were required to stamp their name, the place, and the date of their manufactured goods on their pieces. The word “sterling” came to mean “of unexcelled quality.” From 1670, English homes of the upper classes had silver spoons as a matter of course, and had already started the custom of passing them on to their heirs. American silversmiths widely copied these spoons. In fact, the colonial craftsmen’s first silver goods were spoons Table knives with steel blades started to appear around this time as well. However, silver forks and sophisticated serving vessels were rare until the late eighteenth century. Before the seventeenth century, silver could be melted and poured into shaped molds to be cast into a variety of objects, but more often it was hand beaten with sledge hammers on an anvil, or coerced into flat sheets of the required thickness by a version of the old- fashioned laundry mangle with iron instead of wooden rollers. The hammering of the sheet caused it to become brittle after a certain amount of time, and therefore unfit for further working. At that point, it was annealed, or placed under heat of about 1,000 degrees Fahrenheit (540 degrees Celsius), then plunged into cold water, after which the hammering could be resumed. Later, the silversmiths (or “flatters”) used more sophisticated techniques, such as waterwheels or horse-driven wheels, to pass the metal through the rollers many times until the desired thickness was attained. These techniques were replaced by the steam engine in the eighteenth century. Special hammers—without small faces and sharp comers that might cut the metal—were used to raise the flat sheets of metal into hollow forms, such as pots or the bowls of spoons. Handles for spoons, forks, or knives were shaped by casting. The most common method was to embed a pattern (of gunmetal, wood or plaster) in a two-part frame filled with an adhesive loam mixture, bake it hard, open the frame and remove the pattern, then fill the cavity with molten silver, finally breaking the mold to remove the casting. Pieces fashioned this way showed gritty surfaces that required smoothing with file and pumice. Sheffield plating was the first silver plating technique used. It consisted of attaching a thin skin of sterling to one or both sides of a copper brick, rolling it into flat sheets, and then working it in a similar manner as silver. This technique was replaced in 1842, when electroplating (or sterling silver deposited by electrolysis on a base metal) was introduced. 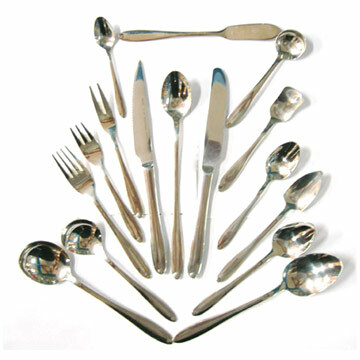 The raw material of silverware is stainless steel, sterling silver, or, in the case of silver- plate, a base metal (such as a high-quality copper alloy) over which a layer of silver is electrically deposited. Stainless steel is a combination of steel, chrome and nickel. The finest grade of metal used in producing quality lines is 18/8 stainless steel. This means that it contains 18 percent chrome, 8 percent nickel. Stainless steel is very popular because of its easy care, durability, and low price. The majority of silver is obtained as a byproduct of the extraction of lead, copper and zinc. Silver is separated from smelted lead bullion by the Parkes process, in which zinc is added to the molten bullion that has been heated to above the melting point of zinc. When the zinc has dissolved, the mixture is cooled and a crust of zinc-silver alloy forms on the surface, because the silver combines more readily with zinc than with lead. The cmst is removed, pressed to remove excess lead and then processed in a retort to recover the zinc for reuse, leaving a silver-lead bullion with a high silver content. Further refining of the bullion is carried out in a cupellation furnace, where air is blown across the surface of the molten metal to oxidize the lead and other impurities to a slag, leaving the silver, which is cast into anode blocks. Final purification of the silver is made by an electrolytic process. Sterling silver consists of 925 pure silver and 75 parts of an alloy (usually copper). This proportion is fixed by law and therefore never varies. The copper alloy adds durability without sacrificing the natural beauty and workability of silver. 1 Production begins with rectangular, flat blanks of stainless steel, sterling silver, or in the case of plated flatware, an alloy. Large rolls are stamped in individual blanks, which are flat pieces roughly the same shape as the piece to be produced. 2 Through a series of rolling operations, these blanks are graded or rolled to the correct thickness and shapes required by the manufacturer’s flatware patterns. First the blanks are rolled crosswise from left to right, right to left, and lengthwise, then trimmed to outline. Each spoon, for instance, must be thick at the base of the handle to resist bending. This gives graded pieces the right balance and a good feel in the hand. Each piece is now in the form of a cleanly finished shape in the rough dimension of the utensil. 4 The rolled blanks are placed in the cutout press by an operator, to remove the excess metal and to fashion the shape of the piece. This process is similar to cutting shapes from rolled dough. The shape of the piece is cut out of the metal and the excess metal is remelted and transformed back into sheets of metal to be used again. This trimming must ensure an accurate fit of the pieces into the dies when the design is applied. 5 The next step is the forming of the pattern. Each pattern has its own hardened steel dies—two dies for each piece, one with the pattern for the front of the piece, and the other with the pattern for the back of the piece. These are carefully set in the hammers by die setters. The operator quickly places a piece in place under the drop hammer, which descends with a hydraulic pressure of 200 tons. (The bases of the drop hammers are bedded in 160 cubic yards of cement.) The metal is squeezed into every tiny detail of the ornamentation in the die, embossing the pattern on the piece. The blow of the hammer hardens the piece for use in the home. Surplus metal around the outline of the piece is then removed by clipping presses. 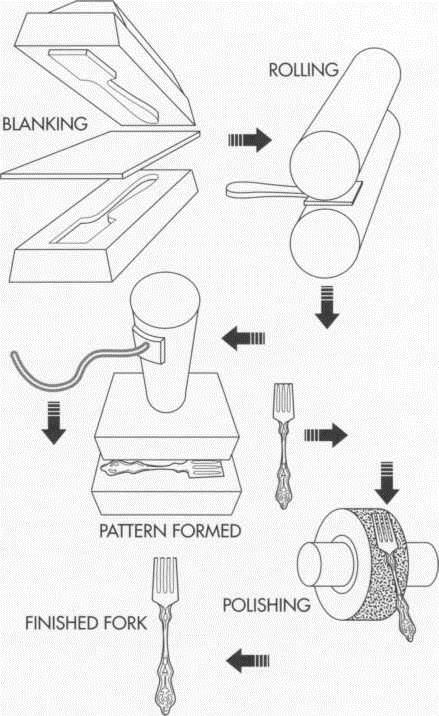 6 Special steps are necessary for the creation of knives, spoons, forks, and holloware pieces. To make the hollow handle for the knife, after two strips of metal are formed to shape, they are then soldered together, buffed and polished until the seam is no longer visible. The blade and handle are permanently joined by means of a powerful cement, which bonds with great strength and durability. 7 With the spoon, after the pattern has been embossed upon the front and back of the handle, the next step is the forming of the bowl. The forming is done again under the same powerful drop hammers from accurate steel dies. Each bowl requires two hammer blows. Surplus metal around the outline of the spoon is removed by clipping presses. A small burr still remains to be removed at a later operation. 8 The forming of fork tines is a similar process to that of the forming of the spoon’s bowl, but the operation takes place before the pattern is applied to the handle. 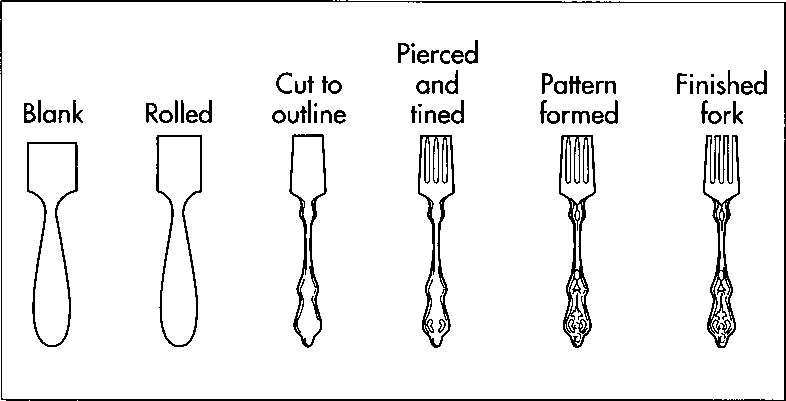 After a fork is cut to outline, it is pierced and tined: the tines are pieced out, and the small piece of metal that holds the tip of the tines together is removed in another operation after the pattern has been applied. 9 For the silver-plated pieces, the electro- plating process is an additional step. The pieces are first prepared by being buffed so that the edges are smooth and the surfaces are free from small holes. When the buffing is completed, the pieces are given a thorough cleaning with as many as 12 different chemical solutions. Finally, they undergo electrolysis, in which a layer of silver is electrically deposited over the base metal. Buffing and sand polishing The knives, forks and spoons are now buffed, then polished. Depending on the pattern, special finishing processes can give silver-plated and sterling silver pieces a bright, mirror-like finish, a soft, satiny glow, or a brushed or florentine finish. Final inspection checks the pieces for chafes, scratches, rough spots between a fork’s tines, discoloration, or any other flaws that might have occurred when the pieces were stamped, shaped and polished. Stainless steel is the preferred tableware for today’s customers, and represents the future for flatware manufacturers. According to a senior executive at Oneida, the last major domestic manufacturer of silverware and plated ware in the United States, purchase of sterling and silver plated ware has been declining for the past twenty years, while demand for stainless steel continues to grow. Clayton, Michael. Christie’s Pictorial History of English and American Silver. Phaidon, 1985. Ettlinger, Steve. The Kitchenware Book. Macmillan Publishing Co., Inc., 1992. Fennimore, Donald L. Silver and Pewter. Knopf, 1984. Freeman, Dr. Larry. Victorian Silver: Plated and Sterling Holloware and Flatware. Century House, 1967. Giblin, James C. From Hand to Mouth: Or, How We Invented Knives, Forks, Spoons & Chopsticks & the Table Manners to go with Them. HarperCollins Children’s Books, 1987. Hamlyn, Paul. English Silver. Hamlyn Publishers, 1969. Hood, Graham. American Silver: A History of Style, 1650-1900. Praeger Publishers, 1971. “Sheet Metal,” How It Works, Vol. 18. H.S. Stuttman Inc., 1987. Schwartz, Marvin D. Collector’s Guide to Antique American Silver. Doubleday, 1975. Science and Technology Illustrated. Encyclopedia Britannica, 1984. Watson, Jim. Sharpening and Knife Making. Schiffer Publishing Ltd., 1987.